All little girls have one thing in common: You dream about the day when you will walk down the aisle toward your partner to promise eternal love to one another, and be married. Now you are grown up, and your day is on its way. Now it's time to decide on a wedding dress! You are going to be trying on many gowns. You'll know you've found the right one when you slip it over your head and look at your reflection in the mirror. Does it feel right? Are your eyes dancing? Can you feel the excitement ? If so, then this gown is incredibly right-for you! Possibly you're reading this with a little longing, because you feel limited to wearing a gown that your mother or grandmother wore. You don't want to break a family tradition or hurt your mom or another relative. But when you don the gown that your family wants you to wear, it just doesn't feel right. Perhaps the fit is too far off even for a seamstress to remedy, or maybe the style is just wrong for you. Well, cheer up! It has become quite acceptable these days for a bride to have one dress for her ceremony and then change into another gown for the reception. There are other reasons why women choose two different types of wedding dress. Maybe the design of the gown you will wear for your actual ceremony is dictated according to your culture or ethnicity. Or perhaps you want to be wed in a church, but there are restrictions on low necklines, backless dresses, or sleeveless styles, and you'd prefer a different look for the reception. Have you set a wedding date? Before you decide on that, take some time to consider the seasons of the year where you live. You have to consider not only the probable temperature, but also the likelihood of high humidity, wind, or even rain. Both your fabric choices and your color scheme are affected by what time of year you choose. You'll want to learn about the various types of silk for your wedding dress. Should you choose a structured silk with a light weave, like Italian dupioni? How about a thick, luxurious Duchess satin, or slinky slipper satin? And there are others! Will georgette or chiffon work better? Have you considered dotted Swiss cotton on a light voile base? Even lightweight fabrics like organza come with style choices. Does climate dictate when you can wear velvet or brocade? Your choice of trims for your wedding dress can also be affected by the weather. Learn when flowers are best, or when to choose lace, beading, fur, or crystals. What about a wrap for your wedding dress? If the time of year-or the time of day-dictates, you can select a bolero, shawl, serape, or other style to complement your gown. Should you wear gloves? Short or long? There are five basic Silhouettes or shapes of wedding dress, we ring the changes with our choice of sleeves, neckline and accessories such as trains and veils. When choosing a style of wedding dress you will want to consider your body type. We can help you decide which one works best for you. Sleeves play a great role in accenting your shoulders and arms, so learn when and how to wear them. 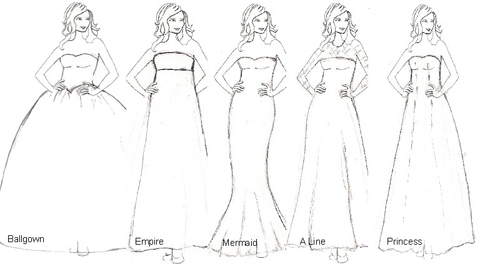 And there are so many types of necklines- scoop, sweetheart, bateau, off the shoulder, asymmetric, and more! Where will you have your wedding? The setting affects your choice of gown: You need one type of dress for a tent wedding, and quite another if your reception is at your country club's ballroom. If the wedding ceremony is in a church, you might want to choose something demure and elegant. If you're taking your vows and celebrating at the beach, you'll want something light and vivacious. If you decide to go for a ceremonial wedding it is also important to understand the rules of etiquette about the attire your partner d there entourage must wear to be dress correctly on this most important day! Personally I think you should look at the event types and take from them what best suit you and your partner and use it as a starting point to plan the look and feel you both want for your day than you can begin to explore all your options. No matter where and when you get married, you want to wear a gown that shows you at your loveliest. We've got plenty of advice and tips for you.